We live in an era of exponential growth of information in the scientific world. To make sense of all this text and data and unlock the potential of this knowledge, we need text and data mining (TDM). 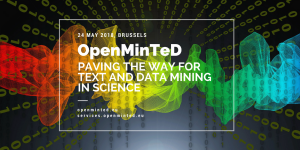 The European project OpenMinTeD has been paving the way for TDM in science by working on an infrastructure for the past three years. Now that the project is coming to an end, we would like to invite you to join us for our final event in Brussels on May 24th. Learn about best practices in TDM, perspectives of different stakeholders, the GDPR and the future of TDM. We welcome all stakeholders who are interested in learning more about text and data mining or sharing their views. Whether you are a publisher or repository owner, software provider or developer, researcher, SME, company, funder or government employee… feel free to join! Sign up through the registration form. You can also find a more detailed programme there.